and clean-up time must be included in rental time paid for. Room deposits are required for all rooms and must be paid at time of reservation. All event deliveries must be received by the organizer. The Highland Parks and Recreation staff or volunteers cannot be responsible for receiving or holding deliveries. Rentals must be vacated from the premises in compliance with scheduled building hours. Permit holders must check-in at the Lincoln Center front office with photo identification and permit before entry to rental rooms. Room Set-up Options: The style of the room set-up must be included with the facility permit. You may choose from the following styles: meeting, registration, banquet, dancing, classroom, or performance. All other styles must be drawn and attached to the permit. Furnishings and Property: Highland Parks and Recreation property must remain in the rented space. All personal property of those using the facility must be removed from the facility upon termination of use. Outside tables and chairs are not permitted in rooms. Food and Beverages: Pre-prepared food & non-alcoholic beverages are allowed in rented rooms. No cooking or food prep in the rooms! Alcohol is permitted only in the Banquet Hall with 30 days’ notice and through properly licensed caterers. We currently have proper paperwork from a short list of caterers, however, a renter can utilize any caterer so long as they provide us with the caterer’s valid permit #210 from the Indiana Alcohol & Tobacco Commission, and the caterer’s certificate of liability insurance naming HPRD as additional insured. A copy of the renter’s contract with the caterer is required. An additional $50 per hour is required for all events having alcohol to cover security (two Highland off-duty officers). Music: Requests for bands, DJs, or amplified music requires pre-approval by Superintendent and will not be permitted with another rental already booked in a nearby room. Inflatable bounce houses: If base is larger than 14’x14’, an insurance policy in the amount of $1,000,000 per occurrence naming the Town of Highland as additional insured is required. Indoor: Only permitted in banquet hall (must be under 14’ tall) or 108/109 (must be under 11.5’ tall). Bounce house will effect room occupancy and must run on 110v. Outdoor: must run on generator. Decorations: All decorating set-up & clean-up must be done within the time frame of the rental and arrangements must be completed by the responsible person. No tape or nails on walls, ceiling panels, doors, or windows. No glitter, no confetti, and no silly string. We suggest using sticky-tack or free-standing decorations such as cardboard cut-outs, balloon bouquets or floral/decorative centerpieces. Guests are the responsibility of the person named on the facility permit. Guests are required to follow the facility permit policies. The person named on the facility permit will be held responsible for the actions of guests who create a disturbance or damage to any Highland Park property. No minors (under 18) will be permitted to use the building unless an adult supervisor is present during the entire rental. If there are minors at the function, they must be supervised and controlled. The permit holder and guests are expected to stay in the immediate area of the room they are renting. Permission to use the facilities may be revoked if any guest fails to comply with the facility permit rules and policies. lanes or park in handicap spots without a proper decal. Prohibited Items: No drugs, tobacco, or firearms are permitted on the premises. Violation may result in immediate arrest /conviction. Safety and Security: No candles or open flames used for heating food. Grills may not be left unattended under any circumstances. All exits must be kept clear of debris, chairs, and other obstructions that would be considered fire hazards. Highland Parks and Recreation is not responsible for any lost or stolen items. In case of an emergency, contact the Highland Police Department at 219-838-3181 or 911. Any injuries incurred on premises should be reported to the Building Supervisor. Room Capacities: 108 (39), 109 (39), 112 (30), 113 (27), 115 (29), 116 (31), 118 (31), Banquet Hall (256). Capacities are regardless of person’s age. Capacity beyond the limit will be considered a fire code violation. Capacity may be lower depending on room set-up. Additional Charges or Penalties: Rooms must be left in the same condition as before the event. Please clean-up after your event to avoid cleaning charges. All trash must be placed in receptacles. Damages: cost of repair, including labor, material, and staff time may be taken out of the room deposit. Events going over rented time will be charged accordingly. . ENTIRE FIELDHOUSE & SHARP ATHLETIC COMPLEX: 80% refunded if cancelled less than 60 days before the event. No refund if cancelled within 7 days. BANQUET HALL & FIELDHOUSE COURT RENTALS: 80% refunded if cancelled less than 30 days before the rental. No refund if cancelled within 7 days. CLASSROOMS, GAZEBO, PICNIC SHELTERS & TABLES: 50% refund if cancelled less than 30 days before the rental. No refund if cancelled within 7 days. DEPOSITS: Upon a satisfactory inspection, a check will be refunded a full week following the rental. All refunds will be charged a $3 processing fee. Credit card refunds will be paid with a check. All refunds must be processed through the Park Board. Refund checks will be mailed the Monday following the Park Board Meeting. All refunds must be applied for one-week prior to the meeting. Any refund requests past this deadline will not be issued until after the next month’s meeting. Absolutely NO CASH refunds will be issued. NO EXCEPTIONS. ALL PARKS: The Town of Highland prohibits the following by ordinance in all park areas: advertising, alcohol/drugs, archery, ATV vehicles, camping/ sleeping, defacing park property, destruction of landscape, disorderly conduct, dumping/littering, firearms, fireworks, gambling, glass containers, golfing, harassing wildlife, horses, metal detectors, mopeds, motor vehicles, open fires, overnight parking, snowmobiles, soliciting, and swimming. Pets must be on leash at all times and owners are responsible for handling pet waste. Rentals must be vacated from premises in compliance with scheduled park hours. Baseball is permitted only at Homestead and Markley Parks. Tennis courts are for tennis use only. Please notify HPRD at 219‐ 838‐0114 for violations of park policies or if you notice a park facility in need of repair. General Event Policies: Room rentals include (depending on availability): tables (set‐up), chairs (set‐up), and garbage cans. Set‐up and clean‐up time must be included in rental time paid for. Room deposits are required for all rooms and must be paid at time of reservation. All event deliveries must be received by the organizer. The Highland Parks and Recreation staﬀ or volunteers cannot be responsible for receiving or holding deliveries. Rentals must be vacated from the premises in compliance with scheduled building hours. Permit holders must check‐in at the Lincoln Center front oﬃce with photo identification and permit before entry to rental rooms. Room Set‐up Options: The style of the room set‐up must be included with the facility permit. You may choose from the following styles: meeting, registration, banquet, dancing, classroom, or performance. All other styles must be drawn and attached to the permit. Food and Beverages: Pre‐prepared food & non‐alcoholic beverages are allowed in rented rooms. No cooking or food prep in the rooms! Alcohol is permitted only in the Banquet Hall with 30 days’ notice and through properly licensed caterers. We currently have proper paperwork from a short list of caterers, however, a renter can utilize any caterer so long as they provide us with the caterer’s valid permit #210 from the Indiana Alcohol & Tobacco Commission, and the caterer’s certificate of liability insurance naming HPRD as additional insured. A copy of the renter’s contract with the caterer is required. An additional $50 per hour is required for all events having alcohol to cover security (two Highland oﬀ‐duty oﬃcers). Entertainment: Requests for bands, DJs, or amplified music requires pre‐approval by Superintendent. Inflatable bounce houses: In‐ door : must run on 110v and be under 14’ tall for banquet hall and under 11.5’ tall for room 108/109. Outdoor: must run on generator. Decorations: All decorating set‐up & clean‐up must be done within the time frame of the rental and arrangements must be completed by the responsible person. No tape or nails on walls, ceiling panels, doors, or windows. No glitter, no confetti, and no silly string. We suggest using sticky‐tack or free‐standing decorations such as cardboard cut‐outs, balloon bouquets or floral/decorative centerpieces. Guests are the responsibility of the person named on the facility permit. Guests are required to follow the facility permit policies. The person named on the facility permit will be held responsible for the actions of guests who create a disturbance or damage to any Highland Park property. No minors (under 18) will be permitted to use the building unless an adult supervisor is present during the en‐ tire rental. If there are minors at the function, they must be supervised and controlled. The permit holder and guests are expected to stay in the immediate area of the room they are renting. Permission to use the facilities may be revoked if any guest fails to comply with the facility permit rules and policies. Property: No Highland Parks and Recreation property or furnishings shall be removed from the facility. All personal property of those using the facility must be removed from the facility upon termination of use. Parking: Please advise guests that the Lincoln Center oﬀers limited parking. Highland Parks and Recreation is not responsible for vehicles parked in the lot or on the street. Please show consideration for our neighbors. Do not block driveways, park in fire lanes or park in handicap spots without a proper decal. Safety and Security: No candles or open flames used for heating food. Grills may not be left unattended under any circumstances. All exits must be kept clear of debris, chairs, and other obstructions that would be considered fire hazards. 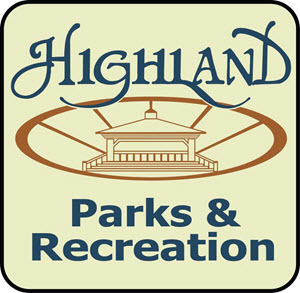 Highland Parks and Recreation is not responsible for any lost or stolen items. In case of an emergency, contact the Highland Police Department at 219‐838‐3181 or 911. Any injuries incurred on premises should be reported to the Building Supervisor. Room Capacities: 108 (39), 109 (39), 112 (30), 113 (27), 115 (29), 116 (31), 118 (31), Banquet Hall (256). Capacities are regardless of person’s age. Capacity beyond the limit will be considered a fire code violation. Capacity may be lower depending on room set‐up. Additional Charges or Penalties: Rooms must be left in the same condition as before the event. Please clean‐up after your event to avoid cleaning charges. All trash must be placed in receptacles. Damages: cost of repair, including labor, material, and staﬀ time may be taken out of the room deposit. Events going over time may be charged up to an additional $100 per hour. A $7.50 fee will be assessed to those presenting N.S.F. checks for programs. This fee must be paid at the Town Hall BEFORE one can participate in the program the N.S.F. check was issued. If more than one N.S.F. check is written in any one year, no further checks will be accepted. Cash payment will be required for all further programs. Permit from Police Department, plus resident signatures must be acquired before processing permit. Must have 8 days notice. Limit of 100 tables, $50 per load of 7 tables, delivered to driveway only – not yards. Block parties are for Highland residents only.